Died: 18 October 1839, Hull Place, St. John's Wood, London. Mary Margaret Morison, b. 1792, Barbados. George Morison, b. 4 April 1793, West Indies. Married: Helena Moore, 7 May 1794. Edward, b. 16 Nov 1795, d. 27 Feb 1837. Viscount Kingsborough. An accomplished scholar who produced Kingsborough's Antiquities of Mexico . Robert Henry, b. 4 Oct 1796, d. 21 Jan 1867. 4th Earl of Kingston. James, b. 8 April 1800. 5th Earl of Kingston. A barrister. Married Anna Brinkley, 25 August 1860. Helena Caroline, d. 9 May 1871. Married Phillip Davies-Cooke, 8 December 1829. Adelaide Charlotte, d. Aug 1854. Married Charles Tankerville Webber, QC, 1834. Held the office of M.P. for County Roscommon between 1797 and 1799. Was styled as Viscount Kingsborough between 1797 and 1799. Succeeded to the title of 3rd Viscount Kingston of Kingsborough, co. Sligo, 3rd Earl of Kingston, 7th Baronet King, of Boyle Abbey, co. Roscommon and 3rd Baron Kingston of Rockingham, co. Roscommon on 17 April 1799. Held the office of Representative Peer [Ireland] between 1807 and 1839, a pro-Catholic Tory. Was created 1st Baron Kingston of Mitchelstown, co. Cork [U.K.] on 17 July 1821. 'The Hon. George King, later known as Big George, was born in 1770. He did not inherit Mitchelstown until he was 53 years old. The years of frustration as the eldest son waiting for his inheritance with little or nothing to do may account for his disastrous tenure. George went to Eton. His leaving portrait by Romney hangs there today. George seems to have paid only half the account, just over £13, leaving his friend the Astronomer Royal to pay the balance. George was the godson of George III so that for much of his life he was welcome at the court and a friend of George IV both as Prince Regent and later when he came to the throne. George's first escapade comes to us through Claire Clairmont, half sister of Mary Shelley, who was told it many years later by George's sister Margaret Mount Cashell. "What a fine night to run away with another man's wife," said Big George. "And why not another man's daughter?" said Miss Johnstone. "Done," said Big George taking her hand. "Done," said Miss Johnstone, giving him hers. Note 1: Inconsistency in George's year of birth. The book, From the Danes to Dairygold: A history of Mitchelstown, by Bill Power, also mentions the above story, giving the year of George's return from the West Indies as 1794. Note 2: Some sources suggest that Amelia Caroline King was in fact the child of Robert King, George's father. County Families – Walford 1868 say George, but Norfolk Archaeology says Robert. These coals were raked over when the will of Rev. Sir Edward Repps Jodrell (Amelia's son) was contested (Jodrell vs. Seale, 1888). Here it came out that the father of the three children was George and that the mother was Caroline Amelia Morison - not "Miss Johnstone" as recalled by Lady Mount Cashell. She never married George, but later - according to one of the affidavits in this case - married a Mr. Sands, a chemist, and resided in Camden, in London, where she had another family. Further evidence comes from The Thanage of Fermartyn by Rev. William Temple (Wyllie & son, 1894), where on page 157, there is mention of one Amelia Morison who "married (it is believed privately) Hon. 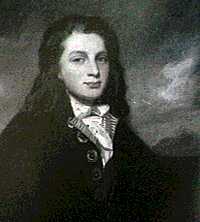 George King, afterwards Earl of Kingston ; had issue a son and two daughters. The son entered the Royal Navy, and was at one time aide-de-camp to the King. One daughter married an English baronet ; the other an English barrister, afterwards a judge at Westminster." Although she had a sister called Caroline, the fact that she is listed as Amelia lends further confusion. Unfortunately Temple gives no dates, other than that her father, Sir William Morison, was born around 1740. However, Sir William was a barrister who worked in Quebec and "Granada" (Grenada) before becoming Chief Justice of the Bahamas, so this does at least explain the connection with the West Indies. 1. John of Gaunt , 1340-1399, Duke of Lancaster, 4th son of Edward III. Married (3rd wife; 1397) Katherine Swynford (nee Roet), c. 1356-1403. 2. Lady Joan Beaufort , 1379-1440. Married (2) Ralph Neville , Lord of Raby, 1st Earl of Westmorland, Earl Marshal, 1364-1425. 3. Richard Neville , 1400-1460, became 5th Earl of Salisbury. Married Alice Montagu, 1421. 4. Lady Katherine Neville, 1442-1503. Married (1) William Bonville, 6th Lord Harington (1443-1460). 5. Cecilia Bonville, 1460-1529, Baroness Bonville and Harington. Married (1) Thomas Grey , 1st Marquis of Dorset (1450-1501), half-brother of King Edward V.
6. Lady Dorothy Grey, before 1501-1571. Married (1) Robert, 2nd Lord Willoughby de Broke. 7. Elizabeth Willoughby, b. before 1522. Married John Paulet, 2nd Marquess of Winchester. 8. Lady Mary Paulet, 1542-1592. Married Henry, 2nd Baron Cromwell of Oakham. 9. Edward Cromwell, c. 1560-1607, 3rd Baron Cromwell. Married Frances, daughter of William Rugge of Felmingham, Norfolk. 10. Anne Cromwell, 1593-1636. Married Sir Edward Wingfield of Powerscourt who died 1638. 11. Lewis Wingfield, d. 1673. Married Sydney, daughter of Sir Paul Gore, Baronet. 12. Edward Wingfield, before 1690-1728. Married Eleanor, daughter of Sir Arthur Gore, Baronet. 13. Isabella Wingfield, before 1707-1761 (sister of Richard, 1st Viscount Powerscourt), married Sir Henry King, Baronet, who died in 1740. 14. Sir Edward King, 1726-1797, 1st Earl of Kingston. Married Jane Caulfeild. 15. Sir Robert King, 1754-1799, 2nd Earl of Kingston. Married Caroline Fitzgerald. George's father. Below: Mitchelstown Castle, Mitchelstown, Co. Cork, was the largest Gothic house in Ireland. George King built it on the site of an older castle between 1823 and 1825. It was looted and burned by the IRA in August 1922. Not having the resources to restore it, the family were obliged to sell some of the stone to the Cistercian monks of Mount Melleray Abbey. The rest was broken up for road building. With a perspective of over eighty years one may now see the destruction of Mitchelstown Castle for what it really was: an act of vandalism that advanced the cause of Irish nationhood not one jot. Sean Moylan, who ordered the burning of the castle, went on to become the Irish Agriculture Minister and, appropriately enough, a creamery was later built on the site. All that remains now are the demesne wall, the gateposts and a cemetery in which Anna, George's daughter-in-law, and her second husband, William Webber are buried. Sic transit gloria mundi.